Great research was recently published by Didier Sornette and Peter Cauwels on a general framework to understanding financial markets and social systems. Sornette is Professor on the Chair of Entrepreneurial Risks at Swiss Federal Institute of Technology, Director of the Financial Crisis Observatory, and spoke about predicting financial crisis (video) at TED last June. Before a critical threshold is reached, these parameters slowly drift, hardly changing the stress in the system, which has, at that point, a quasi-stable characteristic, only disturbed by noise. This gives us an illusion of control, we think that we understand the system and we assume that it will continue behaving as we expect it to for the indefinite future. We make naïve forecasts based on simple extrapolated trends without a real fundamental understanding of the underlying processes. Forecasters are happy and proud that they manage to find a trend and can fit a curve to it, without realizing that in fact they are blind. Examples are the credo that stocks always go up in the long run, the concept that inflation is contained because the velocity of money is low, the idea that governmental debt can always be refunded in the capital markets or that house prices always go up. With the second quarter ending last week and the Fourth of July holiday past, now is a great time to reassess your investment portfolio. 2013 started with a bang in equities. The S&P 500 rose more than 14 percent into May, and then retraced 3 percent to current levels. Not a bad six months. The NIKKEI took off like a rocket ship on “Abenomics” and has returned more than 31 percent, year to date. Gold and commodities have faced a tough road, starting in April, on accelerated selling and concerns over slowing demand in China. Treasury yields and mortgage rates have jumped over the past couple of months. Needless to say, there has been a lot of volatility across the investment space. Much of these price fluctuations have been driven by central bank commentary, monetary policy changes, and participant expectations—a constant tug of war. With interest rates trending sideways until recently and nowhere to go but up in the future, the 30-year bull bond market seemingly ended April, 29, 2013, according to PIMCO’s Bill Gross. (Note: bond yields are inversely related to the price, as yields rise the price falls or visa versa). Rising rates will prove to upset traditional portfolio allocations and, negatively or positively, influence the pricing of many other risk assets. No one has all of the answers, neither can they predict the future or create an impenetrable portfolio that always goes up. If someone tells you otherwise, you should run the other direction, and fast. This reaffirms the value of basing portfolio decisions on a long-term thesis and adjusting with conditions. Whether you are working with professional adviser or individually managing your portfolio, it is important to reassess what has and hasn’t worked so far this year and formulate the best path moving forward. Many participants attempt to time the market or make large moves in and out of assets, which has historically proven to be a loser’s game. It is advisable to frame a macro thesis that guides your portfolio and dollar-cost average into various classes based on such. Adding incremental amounts of capital to your portfolio across a longer horizon ensures that you are buying more (or less) of an asset when it is relatively cheaper (or more expensive), but doesn’t impact the larger picture goals. Even if you bought in at the previous peak of equities on October 9, 2007, and held the position until recently, you would have returned about 16.5 percent. Emotional driven investors exited on the way down or near the bottom and re-entered closer to the recent peak earlier this year, missing an enormous return possibility, as displayed in the charts below. U.S. fiscal policies, Obamacare, and regulatory risks: effect on employment, sales growth, capital investments, etc. Technology, resource scarcity, and sustainable design effect on employment, housing, transportation, food, communication, politics, etc. As a whole, the S&P 500’s forward price to earnings ratio (13.9x) remains below its long-term average (14.9x) and corporate earnings are at all-time highs. Investors should position themselves to capture economic recovery through specific industries’ or countries’ growth potential, while defending as best they can against rising rates and the underlying systemic risks, based on their long-term goals and risk profiles. It is a constant battle to not let emotions or intraday noise drive portfolio decisions, but investing is an ongoing process and self-reflection is a necessary component of growth. Plus, the recent evolution of financial instruments (ETF, ETN, MLPs, etc.) has created many opportunities previously unavailable to retail investors. If nothing else is gained from this introspection, you will at least be more prepared for evaluating the rapidly evolving market landscape. This article was originally featured in the Bellingham Business Journal. Business Insider recently featured a video tour of the NYSE focused on financial journalism and it’s evolution over the past 220 years. The rapid progress just in the last decade is proof of Moore’s Law in the digital journalism realm via real-time dissemination and viewer interaction. Interesting idea from Bob Pisani regarding personal digital assistants to cope with mass information. Resource streaming, also known as volumetric production payments (VPP) or metal purchase agreements, provides commodity exploration and production companies the necessary financing to bring projects into production. This has become an attractive financing option due to the fact that VPP’s are cheaper than equity (no shareholder dilution) and safer than debt, making this a “win-win” for both the mine operator and financing company. 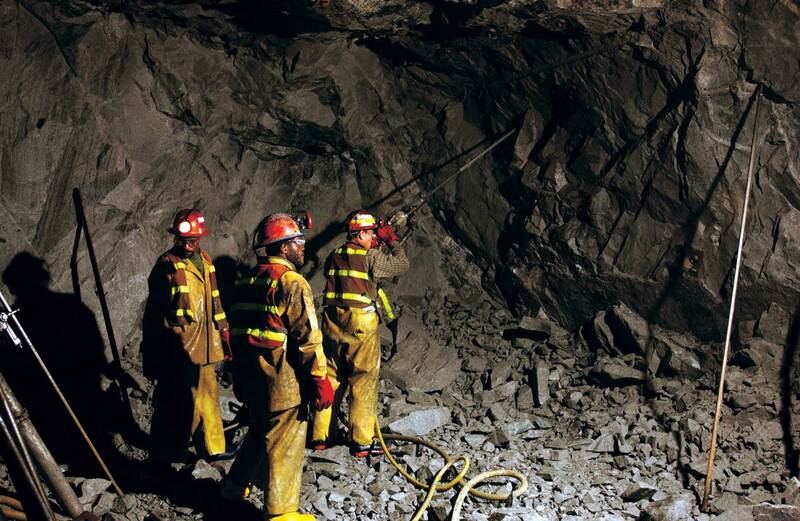 Streaming agreements allow the mining company to capitalize on proven reserves before the operation becomes productive. Checkout the updated Outsider Trading research page which now includes reports covering Mineral Royalty Stream Financing and The Hybrid Solution to Portfolio Management. The latest paper analyzes a lesser known, but quickly evolving, type of financing in the mining industry (abstract below). These diverse agreements are crafted to emphasize each party’s strengths and protect against the others weaknesses. The underwriting financier enjoys the resource upside while avoiding the downside risk associated from operations. Stream financing allows the mine operator to leverage proven reserves to fund production or expansion, while avoiding many negative side effects associated with traditional financing methods. We have some great research projects and articles in the pipeline, stay tuned for more! The fed recently sold its remainder share (ML III) related to the bailout assistance given to AIG during the recession, which resulted in a $6.6 billion profit. NY Fed Documents released by a House panel request shows Geithner’s knowledge of “possible” Libor rate manipulation. I was recently contacted by SprinkleBit, a startup based out of San Diego, California, inquiring my assistance in the development and marketing of the new site to Western Washington University. The founder and CEO, Alexander Wallin, pioneered the basis of the website while researching at UCSD with the help of Professors Dr. Ross Star and Dr. Alex Kane. They formulated the Voting Power Model. 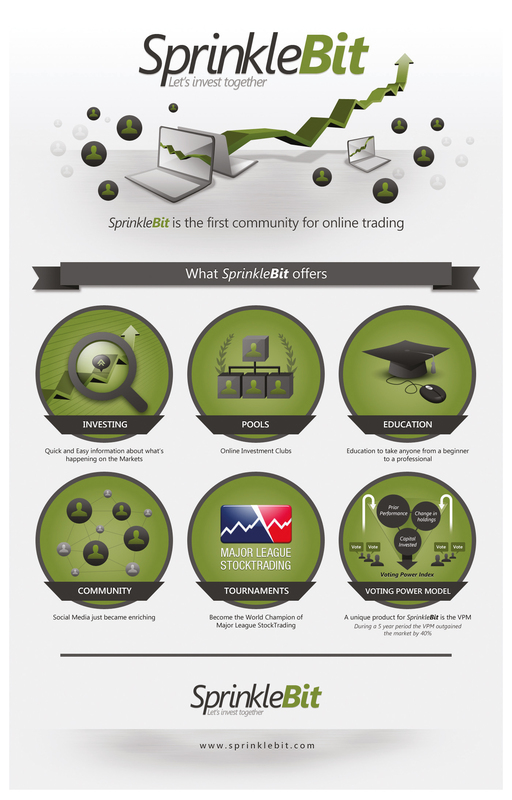 SprinkleBit is the social network of the investment world, a leader in accelerating the current financial industry revolution. Through discussion, interactive education, and hands-on investing, SprinkleBit creates a community environment, allowing you the opportunity to take your investing to the next level. I have enjoyed getting to know the platform over the last week. I highly recommend that you create an account and join my pool, WWU Investment Club. The developers, who are based in Sweden, are constantly adding updates that make the user experience better every day. SprinkleBit allows the user to create a profile, add your own blog, manage a personal portfolio, join pools and tournaments, compete in the Major Leagues of Stock Trading, and to get educated on investing — all with support of the community. I invite you to join me on SprinkleBit and become one of the first to experience the best online community for investors. Warren Buffett, a man of great influential power and career success, is an individual in our society worth learning about and understanding. Given the amount of wealth, authority in the financial markets, government influence, and firm Berkshire Hathaway, Mr. Buffett is a leader in the global investment industry not only through good times but also in bad. In order for society to recover and prosper, it is critical to analyze and learn from leaders such as Warren Buffett. Born in Omaha, Nebraska in 1930 to a US Congressman and Stockbroker father, Warren crawled quickly into the family footsteps. As a young child, Buffett’s ambitiousness and entrepreneurial spirit of his character shined brightly through. Creating a newspaper horse racing picks and eventually pinball business in high school, Warren acquired a financial ability at a young age. His early successes and failures shaped the basis of growth and spurred Buffett’s drive to master the financial knowledge necessary for investing. The returns from early investments grew noticeably through high school and college, aiding the success of later relationships and ventures. It is important to note that success is greatly dependent on when and where you are born. Buffett was born at a great time to succeed in finance. From his early days, he had a competitive advantage over many Americans of the early twentieth century. The familial influences and financial ability provided the groundwork, while major life events taught him the limits of markets. Being born in the great depression and living through the globalization of economies, unfathomable technological developments, and advancements in almost every aspect of life, provided the background necessary to succeed. While pursuing a master’s degree in Economics from Columbia University, Buffett intently developed relationships with professors Benjamin Graham and David Dodd, shaping his value investing guidelines that have molded the success. These mentors had a large impact on both his economic views and investment strategies that are still demonstrated today. Frugality, paired with an eye for asset valuation, is the root of his strategic accomplishments. Examples of such behavior are Buffett’s hobbies, which include playing bridge, Nebraska football, and sharing his vast investing knowledge. Another case of thrifty behavior is seen in the family home, which was bought in 1958 for $31,500 and is still occupied today (Forbes). The delayed gratification, along with successful investments, from many early life decisions has enormously paid off for Buffett, as today he is worth a net $39 billion dollars (Forbes). Shortly after finishing his masters degree, Buffett’s “investment success, particularly in buying undervalued companies whose stocks shortly began to rise, which made him extremely rich and gained him the sobriquet, Oracle of Omaha” (Biography). There have been other notable designations given throughout his career, but the “Oracle of Omaha” impeccably sums up his character and knowledge in three simple words. Buffett is looked to as an oracle of knowledge for the investment community and in many branches of government. Leaders, such as President Barrack Obama, have sought Buffett’s advice on tax reform and the viability of other long-term economic policies for America. Warren’s first wife, Mrs. Susan Buffet, committed her life to her family and loved them very much. She sadly passed away in 2004. A good friend to Warren and Susan Buffett was Astriel Menks. After Susan’s passing, Warren and Astriel became much closer. Currently, Menks is the major female influence and long-term relationship in Buffett’s life. Starting as an investment salesman in 1951, Buffett developed first hand industry experience. Becoming a securities analyst at Graham-Newman Corp., Buffet refined his growing skill set of knowledge. His position allowed for growth and error that benefitted later achievements, first a management position then a partner role in 1956. Warren also established the social networks necessary to succeed. Finally, the legendary Berkshire Hathaway, a textile-manufacturing firm, was acquired in 1970, the beginning of many great successes were to follow. Buffett explains the importance to individuals in making personal expenditure decisions in a letter to readers on the Berkshire Hathaway homepage. Among the many subsidiaries of Buffett’s investment firm, Berkshire Hathaway, three prominent companies stand out. The firm owns GEICO, Borsheims, and Berkshire Hathaway Life Insurance Company of Nebraska (BHLN). Both GEICO and BHLN offer financial security through competitive insurance pricing. Borsheims is a jewelry company that warehouses large quantities of high demand products, allowing for more competitive pricing strategies. Buffett invests in value companies that create more efficient markets, provide excellent returns to shareholders, and ultimately lower costs to the consumer. Today, Berkshire Hathaway is actively traded on the New York Stock Exchange (NYSE) with class A (BRK.A) and B (BRK.B) shares. Shortly after starting the firm, Buffett was forced to close the group to new investors because the demand for his expertise exceeded management goals. Buffett is well known in the investment industry for his annual stockholder letters that the firm sends to its investors, known as the “Essays of Warren Buffett”. He is also the author of many newspaper articles and financial journal publications, such as the New York Times and Forbes magazine. It is interesting to note Berkshire Hathaway’s pattern of buying American. The economic influence and overall theme is that, “Buffett rode to the rescue of several besieged giants during the financial crisis, investing in Goldman Sachs and General Electric, amongst others, during the height of financial panic in 2008 and 2009” (Ovide). The confidence exhibited through Berkshire Hathaway investments in companies that support economic growth in the homeland have greatly paid off for its shareholders. The confidence in America, portrayed not only through Berkshire Hathaway’s investments, but also Buffett’s article publications and interviews, is a rare characteristic to be seen in today’s markets. The housing bubble, economic recession, and European crisis added great volatility and uncertainty to already unstable markets. Buffett, along with a select few others, believe in the capability and power of our economy to recover and succeed as the global economic leader. Based on past investments, Buffett’s foresight seemingly pays great returns, ultimately raising the question of why there are not more investors displaying a similar confidence. A notable rescue, aided by Berkshire Hathaway funds, was given to Wall Street firm Goldman Sachs, who has interestingly faced fraud charges by the Securities and Exchange Commission filings directly related to unlawful and deceptive strategies conducted through its investment division. Buffett displayed his confidence by stating that, “Goldman Sachs is an exceptional institution… (with) a proven and deep management team and the intellectual and financial capital to continue its track record of outperformance” (LA Times). Despite the inherent risk driven culture that has developed in the industry, minor flaws and bad press were not enough to drive him away. By constantly evolving his education and past experiences, Warren faces adversity with enough foresight to use his skill set of knowledge to see the true value in decisions. The $5 billion dollar purchase of Goldman preferred stock provided returns of $3.7 billion in profits. The hastily return of capital to Berkshire Hathaway was an unwelcome thought to Buffett and shareholders, as the easy profit generated from the investment was astronomical (Frye). The massive amount of capital that Berkshire holds allows the firm to leverage investment decisions, demand higher rates of returns, and shape industries in the direction that Buffett feels best. Early in 2011, Warren also invested a whopping $5 billion dollars into Bank of America. The exuberant confidence displayed in American prosperity, post Bank of America investment, is boosting market stability and financial security. By saving companies that he believes are undervalued, Buffett can act as a jetty to break the waves of economic volatility in public markets. Corporations in need of capital are charged greatly for the use of funds. On the latest deal, he is receiving “50,000 preferred shares of Bank of America at a dividend of 6% a year, or $300 million into Buffett’s pocket…also receiving warrants that allow him to buy 700 million shares at a strike price of about $7.14 a share” (Ovide). As an influential shareholder in multiple companies deemed essential to US economic recovery and success, the Oracle can directly address problems as he see’s fit through the use of the firm’s financial power. Buffett holds a large influence on political and economic moguls alike, and he has been expressing his opinions of their successes and failures openly. In a recent New York Times article, written by Warren himself, he brings up the need to “stop coddling the rich”. He asserts that, “Our leaders have asked for “shared sacrifice. But when they did the asking, they spared me. I checked with my mega-rich friends to learn what pain they were expecting. They, too, were left untouched” (Buffett). The issue lies with taxes and social equality between the relative burdens carried by the middle class. Many people think that an increase in taxes will cause a negative effect on economic growth, but they fail to notice the track record of low rates and diminishing advancements. Buffett openly disapproves of many of the current government policies related to income equality and progressive entitlement services. The polarization of wealth with two extremes, towards the upper and lower quartiles, presents an issue that Buffett feels needs to be addressed. The mounting frustrations with Congress are directly affecting the morale of American growth. Warren states that, “they’ve been instructed to devise a plan that reduces the 10-year deficit by at least $1.5 trillion. It’s vital… that they achieve far more than that…only action that is immediate, real and very substantial will prevent that doubt from morphing into hopelessness” (Buffett). As mentioned prior, an important trait Buffett continually exhibits is of faith in the country. More people need to appreciate how lucky they are to be presented with the opportunities that a good portion of the world cannot attain. The message government needs to apprehend is one of getting serious about shared sacrifice. The culture of the investment and finance industry has greatly shifted over the recent decades, which inadvertently raises the question of business ethics amongst corporate management. As moral hazard comes into play, and industry leaders act in the best interests of themselves rather than shareholders, it is really admirable to see the egoless characteristics of Buffetts personality. Berkshire Hathaway is successful because the, “company has a multitude of diversified and powerful streams of earnings, Gibraltar-like financial strength, and a deeply-imbedded culture of acting in the best interests of shareholders” (O’Brien). A similar culture should be enforced and applied to the corporate and government structure to ensure effective leadership and continued success. Another valuable trait that Buffett portrays is his enormous level of charity. Most notably, “Mr. Buffett plans to give away 85% of his fortune, or about $37.4 billion… the greatest share, about $31 billion, into the Gates Foundation” (O’Brien). For society to evolve, philanthropists like this must support causes they believe in. Many characteristics of wealthy individuals do not change as their incomes grow, rather they become more pronounced, allowing for larger charitable contributions to effect change. Buffett advises people in positions of power not to blindly follow others into the future, rather independently analyze the issues and act accordingly. Bill and Melinda Gates, founders of the Gates Foundation, hold similar philanthropic goals. The mass wealth and global success that both Bill Gates and Warren Buffett have achieved has created a deep friendship were, “in addition to traveling together and regularly playing online bridge games, the two men routinely seek out each other’s advice on personal and business matters” (O’Brien). It is important for society to collectively employ similar actions and seek advice, in everyday life, to achieve the desired goals. Gene Tempel, executive director of the Center on Philanthropy at Indiana University, offered the idea that, “most people with this sum of money would try to create their own foundation in their own image; he’s entrusting it to someone with whom he’s had a good close relationship but who is 25 years his junior, who might be around to make sure it is used properly” (O’Brien). Buffett, through his actions, continues to display the importance he places on furthering his beliefs in companies and leaders that create a more efficient economy and society. If more people were to do so, the degree of inequality amongst classes is sure to lower. The wealthy leaders of our society need to utilize their powers in a way that influences and promotes growth. They need to embody the determination to achieve higher bounds, pushing the envelope. The US imports low technology products and exports high technology. This trade combination allows Americans to reach levels of wealth that were unfathomable one hundred years ago. The American spirit, one of entrepreneurial ventures, is extremely vital to our continued success as a country, and Buffett believes it is the duty of educated citizens to promote this. Government and corporate leaders have continually sought Buffetts advice regarding economic turmoil facing their firms. The amount of advice throughout the recession (2007-2009), and today, that Warren continues to divulge is astonishing. Movies and television shows (“Too Big To Fail”) depict the dramatic conversations between treasury and corporate officials, all of which seek the Oracle. Prior to the nationalization of banks, as the financial crisis unfolded, Treasury Secretary Hank Paulson directly asked Warren for his advice on multiple occasions. He also asked if Buffett would “bail out” the failing entities. These leaders, who are compensated accordingly, often directly seek advice from one investment manager because of the great uncertainty and risk associated. Some individuals do not take the time to learn from history or see the importance of critically analyzing past behavior. Buffett has continued to weather economic volatility directly through his financial expertise, which is mostly self-taught, as a basis for foresight. Innate ability is thought to be a key component of success. Buffett’s aptitude for the financial markets is driven by his pursuit of knowledge and practice. Many investors follow leaders, like Warren Buffett, in hopes achieving similar returns. These people, in general, do not understand that the key to continued success is not found in predicting Berkshires next move. Granted, it is possible to capture great returns from investing accordingly to privileged information, it is not a feasible long-term strategy to passively follow industry leaders in attempt to out time their next moves. Past returns are not a cogent prediction of future performance. The necessity of continued education, both in academics and professionally, is critical to future successes on many levels. Through much analysis, Buffett continues to stay true to his beliefs and learn from past experiences. Constantly evolving the basis of understanding, and questioning of past decisions, allows individuals to grow and support causes they believe in. Looking forward, we can learn from Warren’s independence, egoless and frugal behavior as we are faced with challenges in our daily lives. Buffett has forever changed the investment industry, and global economy, through his understanding of business. Without independent thought and collective development, leaders will lose sight of their true aspirations. Individuals in all realms of society can learn from Warren Buffett’s actions to effect the changes necessary for civilization to prosper and evolve. Biography. “Warren Buffett.” 2011. Biography.com, 27 Oct 2011. <http://www.biography.com/people/warren-buffett-9230729&gt;. Buffett, Warren. “Stop Coddling the Super-Rich.” The Opinion Pages. New York Times, 14 Aug. 2011. Web. 29 Oct. 2011. <http://www.nytimes.com/2011/08/15/opinion/stop-coddling-the-superrich.html&gt;. Frye, Andrew. “Buffett Generates $3.7 Billion on 2008 Goldman Sachs Investment Businessweek.” Businessweek – Business News, Stock Market & Financial Advice. 18 Mar. 2011. Web. 31 Oct. 2011. .
Forbes, “Warren Buffett.” Information for the World’s Business Leaders Forbes.com. Forbes, 1 Sept. 2011. Web. 29 Oct. 2011.<http: http://www.forbes.com="&quot; profile="" warren="" buffett/>. LA Times, “Buffett Boosts Goldman Sachs with $5-billion Investment – Latimes.com.” Blogs Latimes.com. Los Angeles Times, 23 Sept. 2008. Web. 31 Oct. 2011. <http://latimesblogs.latimes.com/money_co/2008/09/warren-buffett.html&gt;. O’brien, Timothy L., and Stephanie Saul. “Buffett to Give Bulk of His Fortune to Gates Charity – NYTimes.com.” The New York Times – Breaking News, World News & Multimedia. 26 June 2006. Web. 30 Oct. 2011. .
Ovide, Shira. “Warren Buffett to Bank of America’s Rescue – Deal Journal WSJ.” WSJ Blogs – WSJ. 25 Aug. 2011. Web. 29 Oct. 2011. <http://blogs.wsj.com/deals/2011/08/25/warren-buffett-to-save-bank-of america/>. Can efficient markets create bubbles? Regardless of the industry, market cycles and asset bubbles seem to be quit regular occurrences. The causes of booms and busts usually cannot be narrowed down to one factor, but human nature consistently impacts the severity. Market bubbles are usually capricious and unidentifiable until after they burst. These crashes often lead to enthralling circles of market depression and unemployment across economies. From the recent housing market crash to tulip mania in the seventeenth century, inefficient pricing and crowd hysteria has led to adverse price bubbles time and time again. In attempt to speculate the underpinnings of the bubble phenomenon and derive preventative measures, the following analysis will cover both recent and past events to provide a greater context for understanding of market behavior. Real estate accounts about half of the worlds’ wealth and about twenty eight percent of US gross domestic product. The housing market crash of the recent decade has impacted both local and global economies significantly. A bubble is created when, “the price of an asset differs from its fundamental market value” (Mishkin). Originating in the late nineties and early two thousands, fueled by the decrease in credit requirements, the US housing market started to see drastic increases in demand for homes which pushed prices higher. As more people could afford to qualify for larger mortgages with less money down, more homes where purchased. The bubble grew for close to a decade, peaking in 2006, and finally crashed in 2007. Charles Mackay, in his book Extraordinary Popular Delusions and the Madness of Crowds stated that men often, “think in herds; it will be seen that they go mad in herds, while they only recover their senses slowly, and one by one” (Mackay). Human nature, specifically crowd hysteria, often misguides investor’s in allocating wealth and usually leads to asset bubbles. The housing market experienced an injection of capital, increasing market prices above intrinsic values, which caused it to grow at an unsustainable pace. The unpredictability of bubbles eludes even the brightest of scholars. In 2005, Ben Bernanke, chairman of the Federal Reserve, predicted that there was no concern of a housing bubble and asset values, “largely reflect(ed) strong economic fundamentals” (Henderson). As the market growth continued through 2006, most economic leaders held similar beliefs as Bernanke. Bull markets often lead to crowd hysteria and the common belief that the growth cannot end. Many people have referred to real estate as the safest asset to invest in. This mentality, along with easily attainable credit, led to housing bubble and ultimate crash. Throughout the bubble growth phase some might have called you a fool not to invest in a home, all upside potential and no downside risk. This notion is why market bubbles and human nature are often intertwined. Relaxed credit standards led to increased housing demand, which drove home prices up, creating crowd hysteria and the idea of infinite sustainable growth. Although the effects of the crash are long lasting, the US housing market is not unique in its behavior. Unique and diverse markets, such as that for tulips, even fall prey to asset bubbles resulting from inflated values. Throughout the seventeenth century the Dutch experienced a large demand for tulip bulbs. Due to the rarity of flower and limited supply, the prices for bulbs soared. The belief that tulips held great value spread through the land causing crowd hysteria and increased demand. As people started to understand the true asset value of a tulip bulb, the market collapsed. 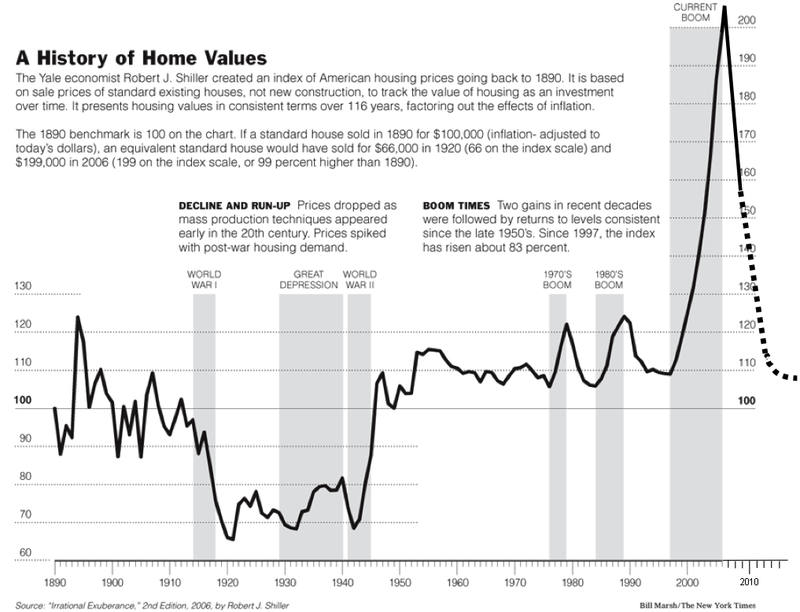 Similar to the housing market, unsustainable growth on the basis of asset prices which do not reflect true intrinsic values led to economic depression and hardships. Asset bubbles can be avoided in perfectly efficient markets. As exhibited through all market bubbles in the past, human nature detracts from the efficiency of rational investment decisions. This false demand drives up asset prices beyond there intrinsic values. In the moment, regardless of the market, it is extremely difficult to analyze and predict growing bubbles. In an age of technology and regulation that increases market efficiency, bubbles are perhaps one of the greatest uncontrollable failures we are faced with overcoming. When the perceived return of an investment is large and the risk is minimal, it is the greatest challenge to all investors not to partake. Henderson, Nell. “Bernanke: There’s No Housing Bubble to Go Bust.” The Washington Post: National, World & D.C. Area News and Headlines – The Washington Post. The Washington Post, 27 Oct. 2005. Web. 19 Oct. 2011.<http://www.washingtonpost.com/wpdyn/content/article/2005/10/26/A205102602255.html&gt;. “Mackay, Charles, Memoirs of Extraordinary Popular Delusions and the Madness of Crowds, Front Matter and Chapter 1.” Library of Economics and Liberty. Web. 19 Oct. 2011 <http://www.econlib.org/library/Mackay/macEx1.html&gt;. Mishkin, Frederic S., and Stanley G. Eakins. Financial Markets and Institutions. Boston: Prentice Hall, 2012. Print.